We were lucky enough to get an invite to the Google Cloud Live conference this year. Being a private, invite-only event it was difficult to know what to expect, but when you hear Google and Cloud Computing in the same sentence you can’t help but get excited. As we queued outside the small-looking building in downtown San Francisco the first thing of note was that this was by no means a massive conference – probably less than 500 attendees. With the attendees being a mix of press, partners and developers, I heard one attendee describe it as a “who’s who of cloud computing”. We had been told to expect some big announcements, so as we sat down to listen to Urs Hölzle give his keynote, the atmosphere was one of eager anticipation. To me, Urs’ title – SVP of Infrastructure at Google – makes him responsible for more compute power than anyone else in the world. The keynote kicked off with a new Google feature: “Live Migration”. 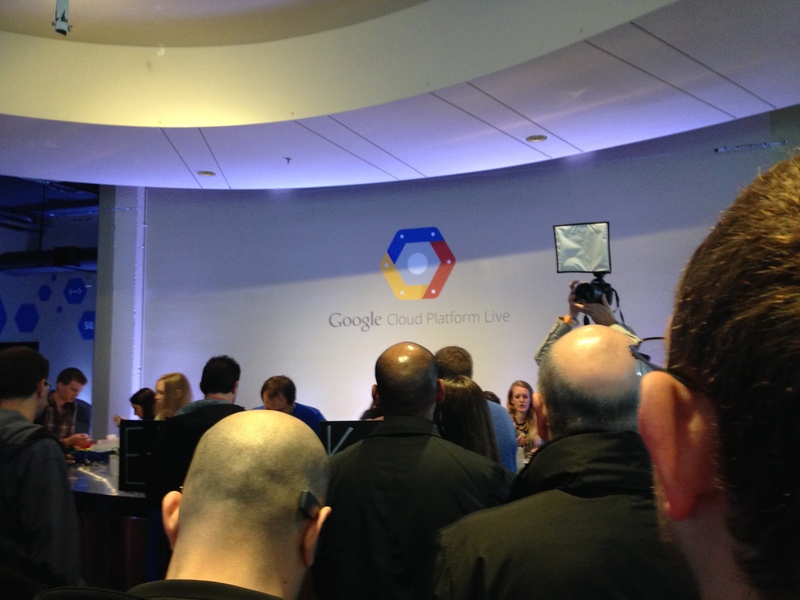 The demo showed a live video streaming from a server in Google’s cloud. They then relocated the server mid-stream – without any interruption to the video service. It was a truly incredible insight into the services that Google is now offering to its cloud-compute customers. Cloud Deployments: This is a massive leap forward and shows how in touch with the developer community Google is. Essentially Google provide a Git server and Jenkins build box and manage all the build and deployment activities for you. Whilst admittedly the devil will be in the detail, the promise is massive and one that we have had to build ourselves for clients on other platforms. With a console for pushing releases to production this provides all the building blocks for best-practice continuous-integration setup. Managed Compute: A hybrid between Platform as a Service (AppEngine) and Infrastructure as a Service (Cloud Compute), it provides a middle ground between between do-it-yourself and a restricted operating mode. A great indication of the next generation of cloud offerings. Real Time Big Data: Google announced a massive uplift in its live streaming capability, now allowing 100,000 request a second to be streamed into BigQuery. BigQuery then provides a low barrier-to-entry SQL-like interface to run queries over the massive accumulated data set. In the keynote there were also some customer insights from Snapchat CTO and co-founder Robert Murphy. Snapchat have been using Google App Engine and Compute Engines pretty much from their earliest release. The best insight for me personally was that Google’s cloud allows Snapchat to have no dedicated infrastructure operational group. This allows all of their engineers to be primarily focused on new feature development. The changes in both cost and structure are clearly aimed at Amazon’s AWS. I really love the new Google pricing model; giving discounts for sustained use rather than just offering reserved instances puts flexibility back into the offering and allows Google to do all of the complicated billing calculations. The announcements also mean there will be much more competition in this market – within twenty-four hours AWS SVP Andy Jassey announced price drops to match Google. It is clear that Google has its sights well-and-truly on AWS and has sent in the ground troops. That said, whilst the price drops are nice, I hope that, in the long-term, this continues to be a competition of service offerings and not a race-to-the-bottom price war. The announcements at this event – as well as everything that’s happened in the year leading up to it – clearly represent a step change in Google’s approach to the holistic cloud offering. Until recently, Google had the established AppEngine offering, which allowed developers to run large-scale apps with very little infrastructure knowledge or care. However AppEngine had little flexibility, with restricted access to the operating system and a limited number of application stacks available to build on. This is great for developers and start-ups but not suited for enterprise. In comparison, Google’s Compute Engine is the classic Infrastructure as a Service (IaaS) offering, competing directly with Amazon’s AWS EC2 products. Furthermore, with ‘Managed Instances’ Google has demonstrated that it continues to think about the next generation of Cloud offering – it’s a great model that allows most of the flexibility of IaaS, but leaves Google to worry about the operational side. At the first Amazon Re-Invent in Oct 2012 (see my blog post recapping this event) Netflix CEO Reed Hastings talked about how cloud computing was just in its infancy, and that worrying about instance types, sizes, regions and scaling should not be necessary in the future. This is clearly the direction of Google is going in with services such as Managed Compute and BigQuery. Following the keynote there were two parallel stream of sessions. We chose to attend “The power of Big Data on the Google Cloud Platform” . 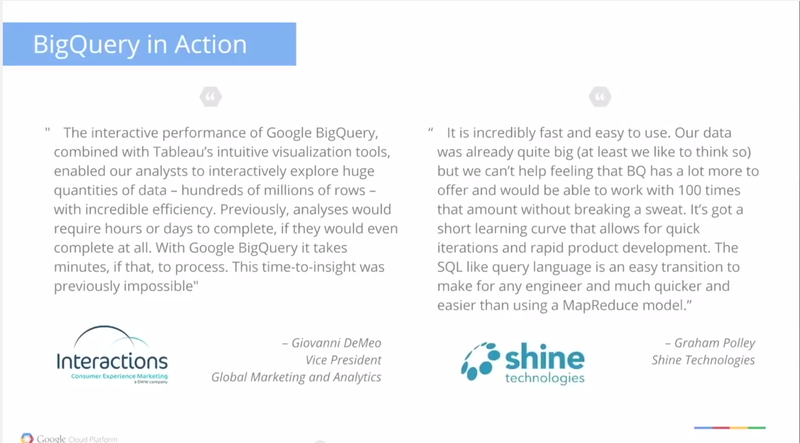 This highlighted some great use-cases of Google’s BigQuery product – an awesome offering that Shine are using at Telstra. Huge props to Graham for getting our name out there! The afternoon was made up of more technical and in-depth dives into various products in the Google Cloud Platform. Of the sessions we attended, the first highlight was “Compute at Google: An Insiders View“, in which I really enjoyed Joe Beda’s insights into how things are done inside Google and how these are being exposed to the public cloud. The other was “Runtime: yours – New runtime support on App Engine“, where Andrew Jessup gave a very interesting and entertaining presentation on the the Google App engine changes. This included a demo running NodeJS on an App Engine VM. What also came across well in this demo was the effort Google has put into making App Engine run on your local machine in much the same way it does on the Cloud. Finally, to wrap up the day there was a “Fireside Chat with Urs Hölzle, Jeff Dean, and Eric Brewer“. Whilst this session was a little disjointed at times, it offered some great insights, with Urs stating that he believes Google’s cloud revenue could outstrip its advertising revenue in the next 10 years. Furthermore, it was revealed that Google’s number-one focus for the year was exposing more of its internal services to the public, with the search and advertising business being in good shape and able to survive not being top priority for a while. That said, the geek in me found listening to Jeff Dean talk about the projects he has worked on truly awesome. Much like James Hamilton at Amazon, Dean is one of those technical geniuses that I could listen to all day long. And the best thing about cloud computing? You have guys like that working for you. As I mentioned in my blog after AWS reInvent 2012, with the barriers-to-entry AWS created on cloud computing, it was hard to see who could compete in the following 3 years. The obvious contender was always Google, and in the last 12 months they have demonstrated that they are not only going compete, they may quite possibly end up dominating this space. Its clear that Google is focused on the developer-lead revolution of computing, and hopes that by offering services and features to developers, the market dominance will come. Whilst I love Google for this approach, it does leave a few gaps in the enterprise space especially in Australia. With no Australian data centre (and no hints of one) we are left with the same problems of data-sovereignty and network-latency that we had in the early AWS days. Also, the “just leave that to us” model can make it difficult to fit into current enterprise requirements for compliance and DR. So whilst I fully believe that Google’s approach represents the future, it is probably a bridge too far for most Australian enterprises right now. But one thing is for sure: with Amazon and Google competing, we are set for a race on innovation and a very exciting time in IT.